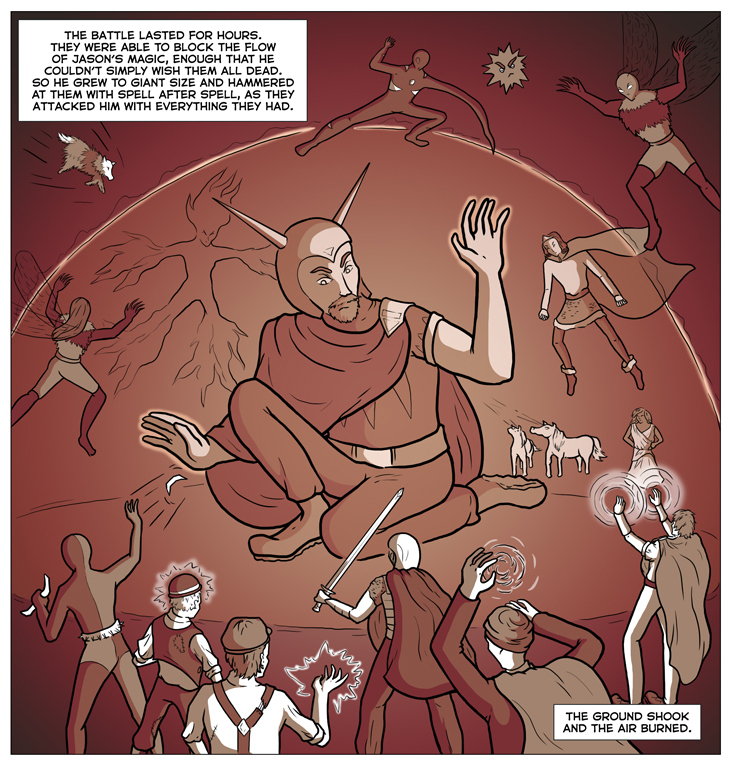 Page 258 came out on Tuesday! 1. Hurray, look at all those heroes fighting the Ultimage! I love seeing these guys teamed up and fighting together. Great to see Marvel Doggy, in the upper left, flying into action. Bee Lady, Flame Girl, Marvel Doggy, Octopus Jones, Space Blot, Bee Man, Lady Fairplay, some Laser Ponies, Sonic Boom, Skelman the Sorcerer, Yarko the Great, Beowulf, some hobomancers, Bart Hill. 3. Sam asked if Jason Occult was supposed to be a giant in this scene; I told her that Josh had drawn him as a giant previously, but since this is a battle that went on for hours, she could choose to draw him before or after the point at which he gets really big. The problem with him being a giant is that it’s hard to fit the non-giant characters who can’t fly into the scene. Josh solved this problem by putting the heroes on an elevated spot, around the level of the Ultimage’s waist, with the Ultimage in the background; Sam solved it by having him kneel. 4. I tried to do some sketches to figure out what the battle could look like, so I could make some suggestions to Sam, but I quickly gave up. There were so many characters, and so many possibilities, I just left to her to her own devices, and I’m very happy with what she did. 5. Like I said, this is a battle that lasted for hours, and there were more people present than the ones pictured here; this is just a snapshot, a single moment in time, that stands in for the larger conflict. I like the idea that the reader can imagine the much bigger battle, with all its twists and turns and daring maneuvers, that it’s a beautiful and perfect comic book crossover event that only exists in your head. 6. As I’ve mentioned before, Kurt Busiek’s Astro City was a big influence on the way I wrote this issue, and the idea that you can basically refer to storylines from comic book series that don’t exist, and write what happens in between the big moments. 7. I’ve enjoyed bringing in other people’s characters, because it gives more of a sense of scope, that this is a cosmic crisis spreading out beyond the worlds I’ve created and into other people’s fictional worlds. That’s how it feels to me, anyway. 8. 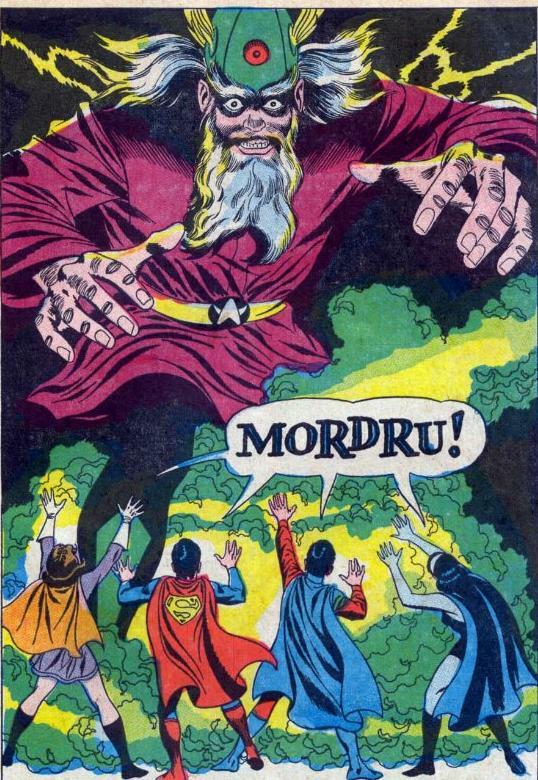 I’ve mentioned several times that I gave Sam reference of the Anti-Monitor fighting super-heroes from the cover of Crisis on Infinite Earths #12, but this is really reminiscent of Mordru fighting the Legion of Super-Heroes. Mordu being a giant wizard with a funny hat and all . . .
9. At the bottom of the page, we return to Brianna’s perspective, which is where we’ll stay for the rest of the story. Not many pages left now! 10. But what is that weird shiny blobby thing? Don’t worry, we’ll find out on the next page, coming in just a few days!